A thymectomy involves the removal of the thymus gland. The thymus gland is found below the breastbone (sternum) but sits on top of the heart. Usually the thymus gland helps to control cell growth as a child as well as fight infections, but its function tapers off as an adult. The thymus is removed because of abnormal growth, tumors, or leading to diseases like myasthenia gravis. Why is it important to have a diseased thymus gland removed? An abnormal thymus gland can cause problems with the immune system. Much like many other parts of the body, the thymus can also develop into a tumor/cancer. In myasthenia gravis, an abnormal thymus is removed to help control symptoms. In thymic tumors, thymus removal (thymectomy) can be used to prevent spread of disease. A full sternotomy means that an incision will be made down the whole length of the breastbone (sternum). This will allow for the most exposure and allows the surgeon to remove the entire thymus gland and any surrounding tumor. The chest is then closed with sternal wires, sutures, and sometimes titanium plates. In this case, a chest tube is placed in the incision or lung, and requires a few days of recovery in the hospital. In comparison to a full sternotomy, a partial sternotomy will make a smaller incision through only half of the sternum in order to expose the thymus. When the gland is sufficiently removed, the incision is closed with sternal wires and dissolving sutures. VATS stands for video-assisted thoracoscopic surgery and involves only a few small incisions made in the chest. The surgeon will use special instruments to remove the thymus through small “ports” in the chest. The small incisions are made on the sides of the chest, where instruments are inserted through these holes. Using a camera mounted on a long instrument, the surgeon is able to see the thymus through a TV monitor in the operating room. This technique is used to decrease the amount of postoperative pain, decrease the risk of wound infection, as well as shorten recovery time. A transcervical procedure places the incision above the thymus at the neck, above the sternum. Through this small incision in the skin of the neck, the thymus can sometimes be removed entirely. Once removed, the incision is easy to close up with stitches or staples. 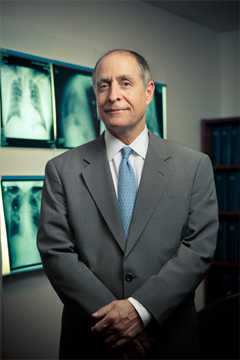 J. Michael DiMaio, MD, is a board certified cardiothoracic surgeon practicing in Dallas, Texas.